Rick Lowell of Portland, Maine’s Casablanca Comics is no stranger to putting on conventions. He’s had 6 straight years of a successful spring indie comics show called MeCAF. So with those experiences at his back, he launched this year a more mainstream show called Portland Comics Expo. With convention season wrapping up and a whole half a year separated from MeCAF, the timing seemed pretty good for one last hurrah for comics in Portland before the long, cold winter sets in. Unfortunately for us vendors/artists and Rick, the public interest in the show did not seem to match our enthusiasm. Let’s discuss why that might be! Unlike the abject failure that was RockCon earlier in the year, I place no blame on the organizers of the show for it being a slow day. Rick is a great host and everything about the set up and organization of the program went as smoothly as any MeCAF I’ve been to. He kept his advertising focus on the artists attending, and unlike GraniteCon there was no extreme distraction in the form of a bunch of b-list TV show actors from a popular show. So why was it so slow? I think this boils down to two factors: Convention fatigue and the mysterious x-factor. There are a LOT of conventions out there, more every year. I’m beginning to suspect that con-goers have too many options right now and their time and money are being spread a bit thin. The other factor, is an unknown quantity. Vermont ComicCon, which took place the same weekend as Portland Comic Con, and run by the organizers of the failed RockCon was an enormous success, according to other cartoonist friends of mine who tabled there. What was the difference? Why was that show successful while the Portland show was mostly flat? There are far too many factors that could effect the answer to that question, and it’s just the nature of business in a given year to have ups and downs. All that said, I did make back my cost of tabling, but not much else. I did still have a great time and I also met some amazing new cartoonists. I’ll take some time now to talk about them! Amanda Kahl is the self publishing power behind a fine fantasy epic called Age of Night. After a brief 70’s dance-off with my table-mate Matt Young I wandered over to join the conversation and discover what this SCAD grad’s work was all about. The art style is definitely very well fit for the genre, a tight mix of realistic character designs, attention to details in textures and dense, dark contrasts to set a good mood for a bar fight! I’m a few chapters in already and love the ramshackle group of adventurers she has coming together, full of witty con artists, innocent mages and failed attempts at debauchery! I’m excited to see where the story and this rag-tag crew goes! Andrew R MacLean is a Mass-based cartoonist who’s Head Lopper was the most interesting comic premise I saw at the show. 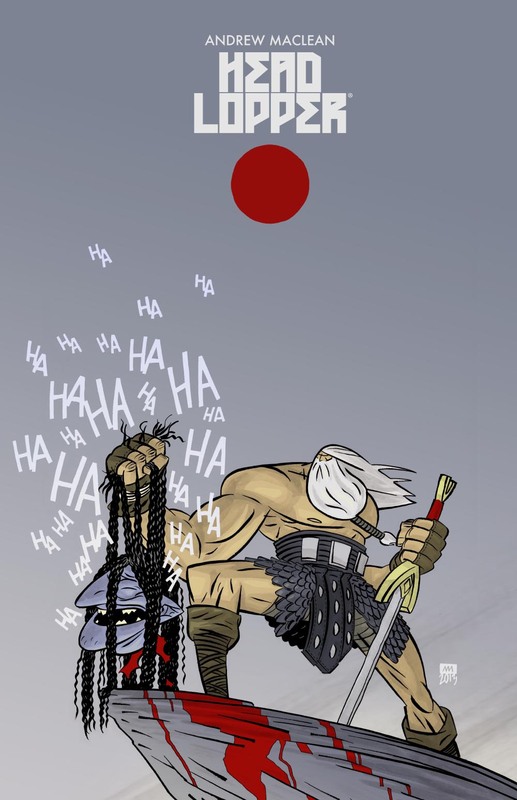 A tongue-in-cheek adventure about swords and monsters…and a talking severed head. Very cool, very bold, sharply illustrated with tight character designs and crisp, simple, well placed lines that express to the n’th degree! Definitely a fun romp of a comic and very polished work! Check out his blog too, he’s been doing some great Alien related sketching this month! Caught up briefly with Christina Siravo who is a staple at MeCAF. 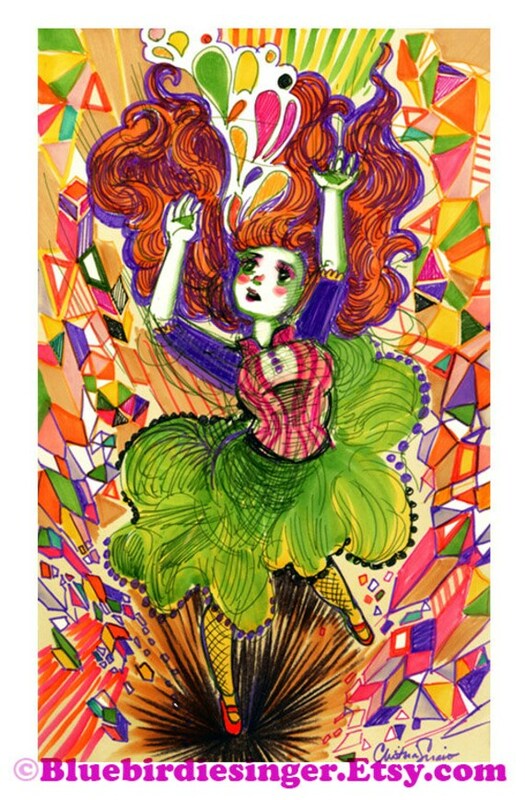 She approaches fantasy art with a child-like wonder and beauty. Her designs are flush with vibrant color and subtle lines. She’s always got a smile on her face and one of the nicest tables you’ll happen across at any show! I love visiting Portland, it’s a fantastic city with a lot of great comics fans. I definitely hope MeCAF continues to be a successful show and perhaps next year Portland Comic Expo, with a little tweaking, can be just as great! My guess for Vermont Comic Con’s success was that there are reasonably few conventions here in state: just an anime and gaming convention, both in the fall. It was a bit more of a novelty thing in our back yard.